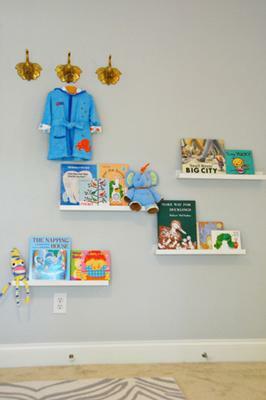 My inspiration for Knox's Modern Safari Nursery started when I spotted the Jonathan Adler Giraffe sconces. 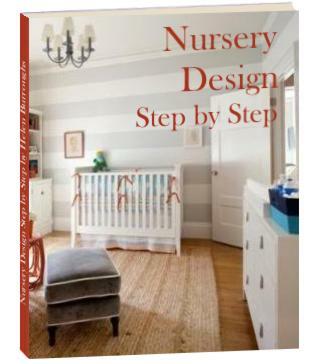 I fell in love with them and knew I wanted to use them in the nursery design. A loose safari theme sort of took off from there, though I hesitate to even call it a "theme" because I was really against having it all be matchy-matchy. A modern color scheme and some vintage finds kept it fresh. 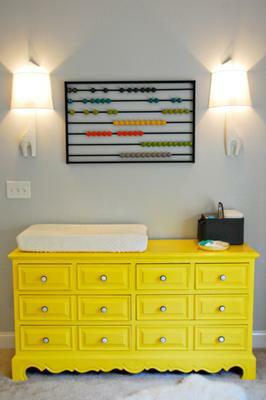 I used Benjamin Moore Silvery Moon paint on the walls and Benjamin Moore Bold Yellow on the dresser/changing table. The crib is the Jenny Lind crib in black. The sidetable is from Target. All other furniture in the room was thrifted. After looking for a long time for non-girly gray and yellow bedding and coming up short, I decided to make the crib skirt and bumpers using some tutorials I found online. The fitted sheet is from Dwell Studio. 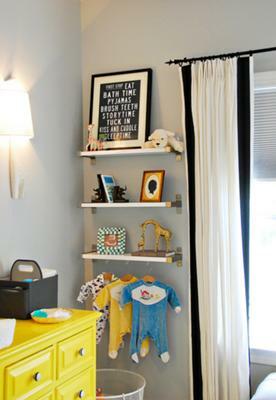 The curtains in our nursery started off as Ikea Merete white twill panels. You can't beat the price (cheaper than buying the fabric even!) I didn't like the grommet top so I cut it off and created a new hem. I sewed 2 together to get a fuller look and used fabric glue to adhere some 3" wide grosgrain ribbon. Viola! Custom curtain panels for less than $50! I paired those with a blackout cellular shade from Lowe's to encourage those afternoon naps! size. I also keep my stock of diapers and wipes in the top drawers. I used two big mesh bins as toy bins and under the window bench I used 3 IKEA baskets for extra toy storage. Several shelves throughout the room hold books and other keepsakes from me and my husband's childhood. It took roughly 5 months to complete the room, though I would say the majority of it came together in roughly 1 month. The rest of the time we were tinkering and refining. And it was SUPER FUN! Imagining how I'd use the room once our baby came home was wonderful. It was the middle of a very hot summer too so I appreciated having some indoor projects to keep me busy. My amazing friend and designer Nicole (http://onmyagenda.blogspot.com) was instrumental in designing the layout of the room and setting the overall safari direction we ended up going in. She sourced a lot of the items we used and helped me think through how to DIY others. We worked through email and online video throughout the process and it was wonderful. My favorite part of the whole process was walking into the room with our baby when we brought him home from the hospital. Actually having a little human to live in the room and being able to use all the things we'd lovingly thought through and organized was a wonderful feeling. I also loved the last few weeks when the room was finished and we were just waiting for his arrival. My husband and I would just sit on the floor in there after work and catch up and talk. There's a lot of love in that room! I love that it's pretty and that I enjoy spending time it it of course but I most enjoy that it's functional. That in the midst of all those design decisions, we never lost sight of how the room would be used, what would be safe, etc. I love the yellow - so bright, modern and sunny! Return to Baby Nursery Photos Contest 2010.